Ready for an Introduction to Mindful Living? Q. What are you most excited about with your workshop at Mad Pride? 1. Dialectical Living is most excited about sharing with Mad activists and allies the innumerable benefits of mindfulness in everyday life on July 15th at Ryerson University (4:30 – 5:45 pm SHE 660 (99 Gerrard St E, near Jarvis)). Thanks to Mad volunteers for setting up this great space. Q What do we need to know about you and your Mad Self (as a group or individual)? 2. What you need to know about Dialectical Living is we are a peer based organization. That means all Dialectical Living employees and volunteers have lived experience. Q How do you describe your experience with madness? 3. Our peers have various experiences with madness. One of our peer workers, Kristen, wrote a great piece on being a mother with a mental health history. Check it out! Q What does Mad Pride mean to you? 4. 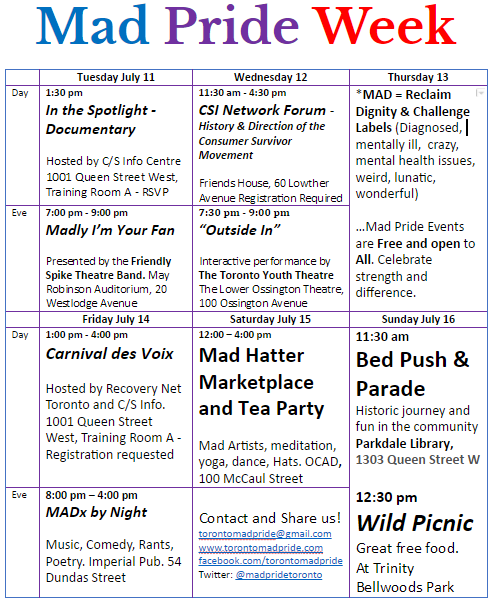 Mad Pride is an anti-psychiatry movement. While Dialectical Living does recognize the need for medical approach procedures in some cases, i.e., diagnosis, prognosis and treatment, we feel as though the impetus of the movement does not lie in the destruction of psychiatry, but creating and supporting alternatives to the medical approach that empower, depathologize and humanize people with mental health histories. Mad Studies, peer support organizations like Dialectical Living, self-help initiatives, mental health activists and allies are all part of a movement that is striving toward the well-being and empowerment of people with mental health histories. Q What’s the best way to work with or resist the psychiatric system? 5. Scientia potentia est. Knowledge is key to working with the psychiatric system. At Dialectical Living, we organize drop-ins that promote stigma reducing discussions on how to “work the system” and get the most out of psychiatric care. Getting the most out of psychiatric care means: (1) getting your needs met, (2) knowing how to communicate those needs, (3) awareness of alternatives and (4) safety. To make sure our peers can get the most out of psychiatric care, we also provide a volunteer based patient advocacy and resource sharing service. 6. TIP! When in distress, we often suggest the use of the DBT skill known as “TIP“. TIP is an acronym for temperature, intense exercise and progressive muscle relaxation. Are you in distress or in a crisis? Start off by reducing your SUDS (subjective units of distress) by placing an ice pack on your forehead or taking an icy shower. The cold temperature will lower your distress level so that you can use other skills. If that doesn’t work, try doing ten jumping jacks or push-ups. Physical exertion can also help with distress! Finish your exercise off by sitting in a chair and taking the time to squeeze different muscle groups in your body while breathing carefully. Progressive muscle relaxation is another quick fix for intense distress. Q Who is the Mad person you would most like to meet (alive or dead)? 7. Dialectical Living would love to meet Dr. Marsha Linehan. While she is not a self-proclaimed “Mad” person, she does claim to have a mental health history. Marsha has saved and improved the lives of countless people with emotion regulation challenges with a treatment she founded – dialectical behaviour therapy or “DBT”.